This article is about the modern sport. For other types of Chinese martial arts, see Chinese martial arts. Wushu (/ˌwuːˈʃuː/), or Chinese Kungfu, is a hard and soft and complete martial art, as well as a full-contact sport. It has a long history in reference to Chinese martial arts. It was developed in China after 1949 in an effort to standardize the practice of traditional Chinese martial arts, yet attempts to structure the various decentralized martial arts traditions date back earlier, when the Central Guoshu Institute was established at Nanking in 1928. 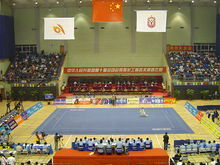 A typical wushu competition, here represented by the 10th All-China Games. "Wushu" is the Chinese term for "martial arts" (武 "Wu" = military or martial, 術 "Shu" = art). In contemporary times, Wushu has become an international sport through the International Wushu Federation (IWUF), which holds the World Wushu Championships every two years; the first World Championships were held in 1991 in Beijing. The World Kungfu Championships are held every four years subset International Wushu Federation, as well. Competitive Wushu is composed of two disciplines: taolu (套路; forms) and sanda (散打; sparring). But it has other disciplines, like self defense, breaking hard objects, and other related practices, that are not performed in competitions. Taolu involves martial art patterns, acrobatic movements and techniques for which competitors are judged and given points according to specific rules. The forms comprise basic movements (stances, kicks, punches, balances, jumps, sweeps, and throws) based on aggregate categories of traditional Chinese martial art styles, and can be changed for competitions to highlight one's strengths. Competitive forms have time limits that can range from 1 minute, 20 seconds for some external styles, to over five minutes for internal styles. Sanda (sometimes called sanshou) is a modern fighting method and a full contact sport. Sanda contains boxing, kicks (kickboxing), and wrestling. It has all the combat aspects of wushu. Sanda appears much like Kickboxing, Boxing or Muay Thai, but includes many more grappling techniques. Sanda fighting competitions are often held alongside taolu. In 1958, the government established the All-China Wushu Association as an umbrella organization to regulate martial arts training. The Chinese State Commission for Physical Culture and Sports took the lead in creating standardized forms for most of the major arts. During this period, a national Wushu system that included standard forms, teaching curriculum, and instructor grading was established. Wushu was introduced at both the high school and university level. This new system seeks to incorporate common elements from all styles and forms as well as the general ideas associated with Chinese martial arts. Stylistic concepts such as hard, soft, internal, external, as well as classifications based on schools such as Shaolin, Taiji, Wudang and others were all integrated into one system. Wushu became the government sponsored standard for the training in martial arts in China. The push for standardization continued leading to widespread adaptation. In 1979, the State Commission for Physical Culture and Sports created a special task force to teaching and practice of Wushu. In 1986, the Chinese National Research Institute of Wushu was established as the central authority for the research and administration of Wushu activities in China. Changing government policies and attitudes towards sports in general lead to the closing of the State Sports Commission (the central sports authority) in 1998. This closure is viewed as an attempt to partially de-politicize organized sports and move Chinese sport policies towards a more market-driven approach. As a result of these changing sociological factors within China, both traditional styles and modern Wushu approaches are being promoted by the International Wushu Federation. In addition to events for individual routines, some wushu competitions also feature dual and group events. The dual event, also called duilian (对练), is an event in which there is some form of sparring with weapons, or without weapons or even using bare hands against weapons. The dual event is usually spectacular and actions are choreographed beforehand. The group event, also known as jiti (集體), requires a group of people to perform together and smooth synchronization of actions are crucial. Usually, the group event also allows instrumental music to accompany the choreography during the performance. The carpet used for the group event is also larger than the one used for individual routines. Previously, international wushu competitions most often used compulsory routines, while high-level competitions in China most often used individual routines. However, after the 2003 Wushu World Games in Macau it was decided to opt for individual routines in international competition with nandu (難度; difficulty movements) integrating a maximum 2 point nandu score into the overall maximum score of 10. There is some controversy concerning the inclusion of nandu in wushu because many of the movements created for the specific events are not originally movements used in those styles. In addition the number of injuries which have resulted from the inclusion of these nandu have caused many people to question their inclusion. Those who support the new difficulty requirements follow the assertion that they help to progress the sport and improve the overall physical quality of the athletes. Chángquán (長拳 or Long Fist) refers to long-range extended wushu styles like Chāquán (查拳), Huaquan (華拳), Hongquan (洪拳; "flood fist"), and Shaolinquan (少林拳), but this wushu form is a modernized style derived from movements of these and other traditional styles. Changquan is the most widely seen of the wushu forms, and includes speed, power, accuracy, and flexibility. Changquan is difficult to perform, requiring great flexibility and athleticism, and is often practiced from a young age. All nandu movements must be made within 4 steps or it will not count for nandu points. Nanquan (南拳 or Southern Fist) refers to wushu styles originating in south China (i.e., south of the Yangtze River, including Hongjiaquan (Hung Gar) (洪家拳), Cailifoquan (Choy Li Fut) (蔡李佛拳), and Yongchunquan (Wing Chun) (詠春拳). Many are known for vigorous, athletic movements with very stable, low stances and intricate hand movements. This wushu form is a modern style derived from movements of these and other traditional southern styles. Nanquan typically requires less flexibility and has fewer acrobatics than Changquan, but it also requires greater leg stability and power generation through leg and hip coordination. This event was created in 1960. All nandu movements must be made within 4 steps or it will not count for nandu points. Taijiquan (太極拳, T'ai Chi Ch'uan) is a wushu style mistakenly famous for slow, relaxed movements, often seen as an exercise method for the elderly, and sometimes known as "T'ai chi" in Western countries to those otherwise unfamiliar with wushu. This wushu form (42 form) is a modern recompilation based on the Yang (楊) style of Taijiquan, but also including movements of the Chen (陳), Wu (吳), Wu (武), and Sun (孫) styles. Competitive contemporary taiji is distinct from the traditional first form for styles it draws from, in that it typically involves difficult holds, balances, jumps and jump kicks. Modern competitive taiji requires good balance, flexibility and strength. The traditional second forms however like cannon fist, are more difficult than the modern forms, But less known and usually taught to advanced students. Dao (刀 or broadsword) refers to any curved, one-sided sword/blade, but this wushu form is a Changquan method of using a medium-sized willow-leaf-shaped dao (柳葉刀). Nandao (南刀 or Southern Style broadsword) refers to a form performed with a curved, one sided sword/blade based on the techniques of Nanquan. The weapon and techniques appears to be based on the butterfly swords of Yongchunquan, a well known Southern style. In the Wushu form, the blade has been lengthened and changed so that only one is used (as opposed to a pair). This event was created in 1992. Jian (劍 or sword) refers to any double-edged straight sword/blade, but this wushu form is a Changquan method of using the jian. Taijijian (太極劍 or Taiji sword) is an event using the jian based on traditional Taijiquan jian methods. Gun (棍 or cudgel) refers to a long staff (shaped from white wax wood) as tall as the person standing upright, but this wushu form is a Changquan method of using the white wax wood staff. Nangun (南棍 or Southern cudgel) is a Nanquan method of using the staff. This event was created in 1992. A Nangun should be as tall as a person holding a fist above his head. There are several basic steps and techniques that must be included in an Optional Southern cudgel event. The basic steps are bow stance, empty stance, dragon riding stance (弓步、虛步、騎龍步). The basic techniques in Southern Cudgel are cleft stick, collapse stick, twisted stick, roll press stick, defend stick, hit stick, uphold stick, throw stick (劈棍、崩棍、絞棍、滾壓棍、格 棍、擊棍、頂棍、拋棍). Qiang (槍 or spear) refers to a flexible spear with red horse hair attached to the spearhead, but this wushu form is a Changquan method of using the qiang. The other major discipline of contemporary Chinese Wushu is 散打 Sǎndǎ, or 运动散打 (Yùndòng Sǎndǎ, Sport Free-Fighting), or 竞争散打 (Jìngzhēng Sàndǎ, Competitive Free-Fighting): A modern fighting method, sport, and applicable component of Wushu / Kung Fu influenced by traditional Chinese Boxing, of which takedowns & throws are legal in competition, as well as all other sorts of striking (use of arms & legs). Chinese wrestling methods called Shuai Jiao and other Chinese grappling techniques such as Chin Na. It has all the combat aspects of wushu. Chinese martial artists also compete in non-Chinese or mixed combat sports, including Boxing, Kickboxing and Mixed Martial Arts. Sanda is practiced in tournaments and is normally held alongside taolu events in wushu competition. For safety reasons, some techniques from the self-defense form such as elbow strikes, chokes, and joint locks, are not allowed during tournaments. Competitors can win by knockout or points which are earned by landing strikes to the body or head, throwing an opponent, or when competition is held on a raised lei tai platform, pushing them off the platform. Fighters are only allowed to clinch for a few seconds. If the clinch is not broken by the fighters, and if neither succeeds in throwing his opponent within the time limit, the referee will break the clinch. In the U.S., competitions are held either in boxing rings or on the raised lei tai platform. Amateur fighters wear protective gear. "Amateur Sanda" allows kicks, punches and throws. A competition held in China, called the "King of Sanda", is held in a ring similar to a boxing ring in design but larger in dimension. As professionals, they wear no protective gear except for gloves, cup, and mouthpiece, and "Professional Sanda" allows knee and elbow strikes (including to the head) as well as kicking, punching and throwing. Some Sanda fighters have participated in fighting tournaments such as K-1 , Muay Thai, Boxing and Shoot Boxing. They have had some degree of success, especially in Shoot boxing competitions, which is more similar to Sanda. Due to the rules of Kickboxing competition, Sanda fighters are subjected to more limitations than usual. Also notable competitors in China's mainstream Mixed Martial Arts competitions, Art of War Fighting Championship and Ranik Ultimate Fighting Federation are dominantly of wushu background. Sanda has been featured in many style-versus-style competitions. Muay Thai is frequently pitted against Sanda as is Karate, Kickboxing, & Tae Kwon Do. Although it is less common, some Sanda practitioners have also fought in the publicly viewed American Mixed Martial Arts competitions. Wushu is not a Summer Olympic sport; the IWUF has repeatedly backed proposals for Wushu to be added to the Olympic programme, most recently as one of eight sports proposed for the 2020 Summer Olympics in Tokyo, Japan. However, it failed to reach the final shortlist, and the International Olympic Committee (IOC) ultimately voted for the re-inclusion of wrestling instead. Wushu was formally introduced into the Olympics as an exhibition sport in Berlin, in 1936, under Chancellor Hitler's request. In March 2015, IWUF executive vice president Anthony Goh stated that the Federation was planning to propose Wushu again for the 2024 Summer Olympics. As part of new IOC rules allowing host committees to accept proposals for new sports to be added to the programme (allowing the addition of sports of local interest to the Olympic programme under an "event-based" model), in June 2015, Wushu was shortlisted again as part of eight sports proposed for inclusion in the 2020 Games in this manner. However, it did not make the final shortlist of five. Owing to its cultural significance in China, the IOC allowed the organizers of the 2008 Summer Olympics in Beijing to hold a Wushu tournament in parallel with the Games as a separate event—the first time that the IOC has allowed such an event. Wu Bin (吳彬/吴彬) – Jet Li's coach in the Beijing Wushu Team, training more wushu champions than any other coach in China. Jet Li (李連杰/李连杰) – possibly the most famous wushu practitioner in the world. He started wushu as a competition sport and gained fame as he took the National Wushu Champion of China title five times as an original member of the Beijing Wushu Team, he was later selected to demonstrate his wushu on the silver screen in the worldwide hit film Shaolin Temple. Many of his old teammates have also appeared on-screen with him, especially in his older movies. Donnie Yen (甄子丹) – Chinese martial artist and actor, trained with the Beijing Wushu Team. Gold medalists for various international Wushu Competitions. Known for his portrayal of Ip Man, mentor of Bruce Lee. Ray Park – Showcased his skills in wushu in several major films, including his portrayal of Darth Maul in 1999's Star Wars: Episode I – The Phantom Menace, as well as Toad in the film X-Men (2000) and as stunt-double for Robin Shou and James Remar in Mortal Kombat: Annihilation. He also heavily retrained prior to filming G.I. Joe: The Rise of Cobra, in which he portrayed the martial arts expert Snake Eyes. Steve Coleman – Longest running Great Britain Wushu champion 2002–present, Captain GB Wushu Team, starred as Shane Powers in film On the Ropes (2011 film). Jon Foo – Learned Kung Fu when he was 8 years old, but didn't begin serious training in Wu Shu until he was 15. Starred as Jin Kazama in the film adaptation of Tekken. Jade Xu (徐慧慧) is a martial arts actress and multiple World Wushu Champion. She won the World Championships three times in a row and the first (gun/staff) and second (dao/broadsword) place in the Olympic Wushu Tournament Beijing 2008 and became one of the most famous female Wushu athletes in the world. Soon after her athletic career, Jade Xu received offers to star in various international Film and TV productions, such as Tai Chi 0, Tai Chi Hero and Michael Jackson: One, and successfully launched her second career, as an actress. Hossein Ojaghi:He is an Iranian Sanda fighter and one of the best Sanda fighters in history. He has won many medals in every kind of international martial arts and Sanda competitions. Nowadays he is the coach of the Iran national team. Muslim Salikhov: He is one of the most technical fighters in sanshou. He has participated in MMA competitions such as Ultimate Fighting Championship(UFC). Salikhov is from Russia. Cung Le: Cung Le is an American Vietnamese and great wushu sanda and Mixed martial arts fighter. He has won a lot of medals. Zhao Changjun (赵长军) – One of the best classical contemporary wushu legends of the 20th Century. His rivalry with Jet li was legendary, losing first place in men's longfist at the 1978 Men's Longfist competition, legend says it was due to Zhao's pinkie being slightly off, resulting in a minuscule deduction that cost him gold. After Jet li left to become an actor, the playing field was set and for nearly an entire decade Zhao Changjun was left to dominate the scenes in national Wushu competitions in the 80's. It has been said that "the '70s belonged to Jet, but the '80s belonged to Zhao". Trained both in traditional and contemporary Wushu, Ditang Quan, Gunshu and Daoshu are known as "Zhao's Three Uniques". He was also trained in traditional Cha quan, a uniquely Muslim traditional wushu style. Retiring in 1987, he currently owns a Wushu school. Liu Yu is an author, former Head Coach of the U.S. Wushu Team from 1997 to 1999. She is now teaching at the Wushu Taichi Center located in San Luis Obispo, CA. Philip Sahagun is a martial arts champion who has promoted the art of Wushu as a finalist on two of China’s top-rated reality competitions, Kung Fu Star and Jackie Chan’s Disciple. In 2008 & 2009, Philip performed Wushu while touring as a martial arts ‘Ninja’ performer for Tina Turner, Queen of Rock and Roll, record breaking Tina! : 50th Anniversary Tour. He has represented America twice at the World Traditional Wushu Festival in China winning both gold and silver medals for the U.S. Team. Today he serves as the head Instructor of traditional Martial Arts at his family owned and operated South Coast Martial Arts in Southern California. Yuan Wenqing (原文庆) – One of the most famous, successful, and skilled wushu practitioners in the world who has won countless gold medals in Chinese, World, and Asian Championships. He is a former Shanxi wushu team athlete trained by the coaches Pang Lin Tai and Zhang Ling Mei. He is most famous for his ChangQuan, DaoShu, GunShu, ShuangDao, and DiTangQuan. A number of his routines (TaoLu) became the official standard competition routines (GuiDing) for a number of years until the new GuiDing TaoLu's were introduced. Zhao Qingjian (赵庆建) – Started learning martial arts at the age of 7, and was a standout member of the Beijing Wushu Team. Retained his #1 ranking at the 2009 All China Games. Currently has retired from the professional circuit of competition. Wushu has faced criticism as a competitive sport. It has been criticized by some traditional martial artists for being too commercialized, losing many of its original values, and potentially threatening old styles of teaching. Such critics argue that contemporary wushu helped to create a dichotomy between form work and combat application. ^ Liu, Melinda (18 February 2010). "Kung Fu Fighting for Fans". Newsweek. Archived from the original on 30 August 2008. ^ Wren, Christopher (11 September 1983). "Of monks and martial arts". New York Times. Retrieved 11 August 2010. ^ Fu, Zhongwen (2006) . Mastering Yang Style Taijiquan. Louis Swaine. Berkeley, California: Blue Snake Books. ISBN 1-58394-152-5. ^ Lee, Sb; Hong, Jh; Lee, Ts (2007). "Wu Shu". Conference proceedings : ... Annual International Conference of the IEEE Engineering in Medicine and Biology Society. IEEE Engineering in Medicine and Biology Society. Conference. British Kung Fu Association. 2007: 632–5. doi:10.1109/IEMBS.2007.4352369. PMID 18002035. Retrieved 27 August 2008. ^ Lorge, Peter (2012). Chinese Martial Arts From Antiquity to the Twenty-First Century. Cambridge: Cambridge University Press. ISBN 978-0-521-87881-4. ^ "Minutes of the 8th IWUF Congress, International Wushu Federation". International Wushu Federation. 9 December 2005. Archived from the original on 14 June 2007. Retrieved 26 August 2008. , archived from the original Archived 30 June 2007 at the Wayback Machine on 2007-06-14. ^ "Wushu Glossary". Official Website of the Chinese Olympic Committee. Retrieved 28 September 2017. ^ "Rules for International Wushu Taolu Competition (International Wushu Federation)" (PDF). Retrieved 29 September 2017. ^ Fetters, Ashley (13 August 2012). "The Summer Olympic Sports of the Future". The Atlantic. Retrieved 19 May 2015. ^ "Wushu eyes slot for 2024". The Jakarta Post. Retrieved 19 May 2015. ^ Staff (14 February 2013). "IOC drops wrestling from 2020 Olympics". ESPN. Retrieved 7 March 2013. ^ "Olympic Games: Snooker misses out on 2020 Tokyo place". BBC Sport. 22 June 2015. Retrieved 23 June 2015. ^ "Olympics: Skateboarding & surfing among possible Tokyo 2020 sports". BBC Sport. 28 September 2015. Retrieved 29 March 2016. ^ Madrid, Michael (21 August 2008). "Kung-fu makes Olympic showcase debut". USA Today. Retrieved 19 May 2015. ^ "Rogge says wushu no "Olympic sport" in 2008". Xinhua. Archived from the original on 28 November 2006. Retrieved 19 May 2015. ^ Baker, Andrew (8 August 2008). "Slower, lower, weaker: Wushu contest cuts a dash at the same time as Beijing Olympics". The Telegraph. Retrieved 19 May 2015. ^ "Wu Bin". US Wushu Academy. Archived from the original on 29 September 2011. Retrieved 6 September 2011. ^ "Donnie Yen Biography". Biography. Starpulse. Archived from the original on 8 October 2012. Retrieved 2 April 2009. ^ Berwick, Stephan (23 December 2000). "Donnie Yen: The Evolution of an American Martial Artist". Kung Fu Magazine. Retrieved 11 May 2015. ^ "Donnie Yen: The Next Martial Arts Icon". Goldsea Asian American. 21 September 2012. Retrieved 11 May 2015. ^ Reid, Craig. "Ray Park and Martial Arts: Part 1". Kung Fu Magazine. Retrieved 24 February 2010. ^ Reid, Craig. "Ray Park and Martial Arts: Part 2". Kung Fu Magazine. Retrieved 24 February 2010. ^ Reid, Craig. "GI JOE – YO JOE, The Snake Has Returned". Kung Fu Magazine. Retrieved 22 February 2010. ^ "Zhao Changjun Kung Fu Institute - Zhao Changjun". zhaochangjun.net. Archived from the original on 19 October 2013. Retrieved 5 July 2013. ^ Ching, Gene Ching; Gigi, Oh. "Where Wushu went wrong". kungfumagazine.com. ^ Liu, Yu; Cerf, Dawn (2010). Awakening the Sleeping Tiger: The True Story of a Professional Chinese Athlete. CA: The CLiu Yu. p. 398. ISBN 978-0-9828262-0-1. ^ Burr, Martha. "China's Brightest Star". Kung Fu Magazine. Retrieved 1 March 2012. ^ Gene Ching. "The Wushu Champion from Shaolin". Kung fu Tai Chi Magazine. Retrieved 1 March 2012. ^ Ching, Gene; Ching, Andy. "China Gets the Gold!". Kung Fu Magazine. Retrieved 22 February 2010. ^ Borkland, Herb. "Salute to Wushu". Kung Fu Magazine. Retrieved 22 February 2010. ^ Ching, Gene; Gigi, Oh. "The Tradition of Modern Wushu". Kung Fu Magazine. Archived from the original on 14 March 2013. Retrieved 22 February 2010. ^ Ching, Gene; Gigi, Oh. "Where Wushu Went Wrong". Kung Fu Magazine. Retrieved 22 February 2010. ^ tianrong, An; Aiping, Cheng. "Wushu Needs Name Rectification". Kung Fu Magazine. Retrieved 22 February 2010. ^ Kuhn, Anthony (16 October 1998). "Chinese Martial-Art Form Sports Less Threatening Moves". The Los Angeles Times. Retrieved 25 November 2010. Mastering WUSHU by Jiang Bangjun and Emilio Alpanseque, ISBN 978-1-933901-31-2. Fundamentals of High Performance Wushu: Taolu Jumps and Spins by Raymond Wu, ISBN 978-1-4303-1820-0. Wikimedia Commons has media related to Wushu. Wushu.in - A largest martial arts community online, Providing detailed information of all Martial Arts Styles, Martial Arts Competitions, Styles and Forms, Martial Arts Legends and Practitioners around the world.